Learning music is one of the greatest gifts a parent can bestow upon a child. Children that learn music tend to excel over non-musicians in almost every way—academically, artistically, socially—you name it. After years of teaching guitar lessons, it has become evident that parents have as much of an impact on a child’s music education as the kid does. Parenting styles come in countless varieties and iterations, each having a different effect on the child’s dedication, interest, and adeptness to learning their instrument. Here are 7 tips that will allow you to be the best rock-mom or jazz-dad out there. 1. Get your son or daughter a decent instrument. Nothing will discourage a student faster than an instrument that is difficult or impossible to play. DO NOT buy a guitar starter kit. While it may be cheaper initially, you are essentially throwing money away when your child stops playing in less than a month because he or she cannot get the guitar to sound good. There are plenty of quality beginner guitars out there for around $200. Yamaha and Ibanez make great first guitars. Check out this super comprehensive guide for buying guitars (and a ton more) from our friend Bobby over at GuitarChalk.com. 2. Remember that a guitar teacher should be someone your child likes. Make sure you shop around when setting out to hire an instructor. As a rule of thumb, you get what you pay for. There are plenty of great musicians out there that are poor educators. A good instructor will be a role model to your child while making them excited about their lessons. Kids learn best when they are having fun! Make sure to ask your little rocker if they like their teacher. If they don’t, the hobby will be short lived. 3. Hold your child accountable. The only way to learn how to play guitar is through practice. No matter how much your son or daughter loves to play, practice will inevitably be a point of contention. Make a schedule for your student and reward them for sticking to it! Prizes are great sources of motivation. Despite how you may feel, it is your job as the parent to make sure your child practices. If it feels like a constant battle, work with the guitar instructor to figure out a system of practice that works for your child. 4. Encourage! Kids love to be told that they are good at something. Even if practice time sounds like a choir of dying cats, make sure your kid knows that you love it when they play. If you keep encouraging them, it won’t sound bad forever! 5. Expose them to great music. While playing is the craft, music is the inspiration. Children take on the musical tastes of their parents, especially at younger ages. If the only sound coming through the speakers is talk radio, your child won’t fall in love with music. Make a playlist of the songs your son or daughter is working on and get to listening! It’s much easier to learn a song if you are familiar with it, and a child is more likely to stay motivated if they are constantly listening to music they aspire to play. 6. Regularly touch base with the instructor. This is something the teacher should be doing anyway, but if they are not, be sure to take the initiative. You and the teacher are a team. You need to be aware of where your child is struggling so you can help them improve in those areas. Even if you are tone-deaf, and the only instrument you play is the stereo, you can still work with the instructor to help your kid succeed. 7. Take lessons too! 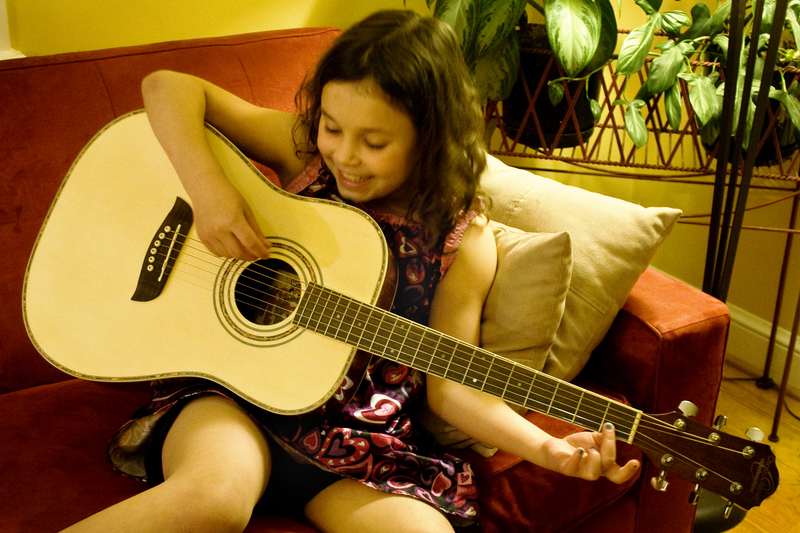 Guitar lessons are a special way for you to bond with your child. This is not just a rewarding shared experience—children who learn alongside their parents often have extra motivation and end up quickly surpassing their parents! The beginning stage of learning an instrument is always the hardest part, but going through it with your child makes it that much easier.